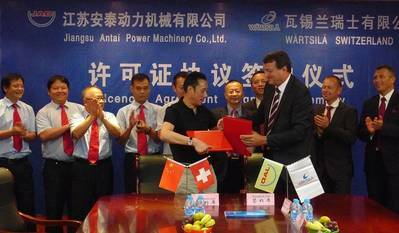 Wärtsilä Switzerland Ltd inform that it has signed a licence agreement for the manufacture and sales of Wärtsilä 2-stroke marine engines by China-based Jangsu Antai Power Machinery Co. Ltd. (JAD) which is the former large horse-power division of Wuxi Diesel Engine Plant). Under the terms of this agreement, JAD will be able to manufacture and sell the entire portfolio of Wärtsilä 2-stroke engines. Initially, JAD will focus on small and mid-sized engines up to and including the Wärtsilä X-72 bore engines. It is expected that the manufacturing capacity of JAD will make a significant contribution to the delivery of Wärtsilä low-speed marine engines to the large and still growing Chinese shipbuilding industry. "We are delighted to establish this co-operation with one of China's major engine producers. Jangsu Antai Power has a well-deserved reputation for quality, and together we can serve our customers in China with faster delivery of Wärtsilä engines featuring the very latest technology," says Martin Wernli, Vice President, 2-stroke, Wärtsilä Ship Power and Managing Director of Wärtsilä in Switzerland. JAD was awarded ISO 9001 quality system certification as early as 1996, and is approved by CCS, BV, GL and other classification societies. The agreement was signed at a ceremony in Jingjiang City, China by Chen Guochong, Chairman of JAD and Martin Wernli, Wärtsilä Ship Power. Pictured: Mr Chen Guochong, Chairman JAD and Mr Martin Wernli, Vice President, 2-stroke, Wärtsilä Ship Power and Managing Director of Wärtsilä in Switzerland.